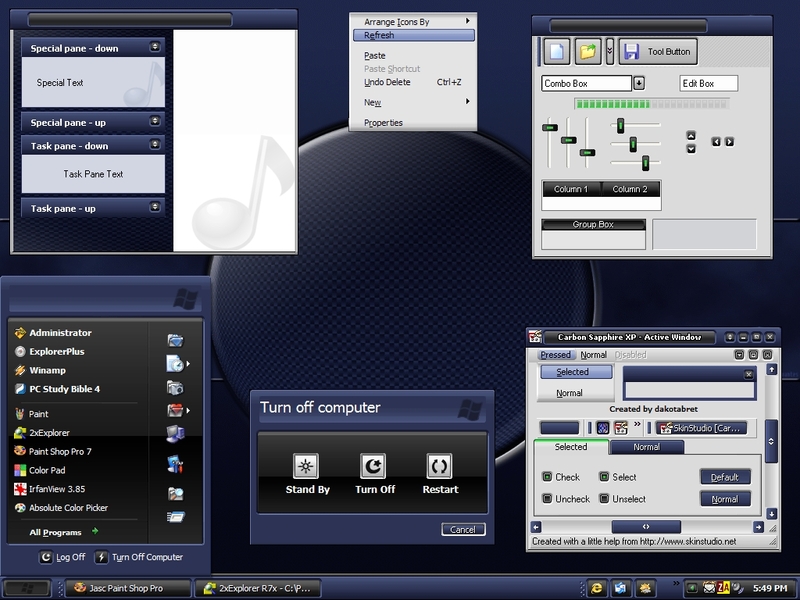 Everything skinned here except toolbar icons and animations. UPDATE 8.7.05: Reworked the menus and highlight bar and also added a matching wallpaper by Malachi Cervantes (with permission). Enjoy! Blue and beautiful - Best of all it is neat. I really like it and will be using it. Thanks for sharing. One additional comment after utilizing this skin. The highlighting of "My Programs" in the start menu is the only area I would change. Doesn't fit the rest of this skins highlighting characteristics. Still, this remains one of the nicest skins I have seen so far. Very, very nice skin, well done. Thanks everyone... and I will double check the "My Programs" area for you yorkeyone. Thank you, that would really be appreciated since I now use this skin and really do like it. This is awesome and couldnt have at a better time (at least for me) I was using your fantastic "Industrialized" Wb, but needed some color to go with a new Ip. I'm probably going to be changing the color when the mood hits and just using this skin from now on. This wb just like "Industrialzed" fits my taste perfectly. My hat goes off to ya. Thanks again... I am considering making a green version of this skin. I am personally using a deep blue version of Industrialized which has a slightly different look to it. It has some glassy touches to it. Very nice! I usually like lighter skins, but this is so well done that I may change my mind! Amazing skin. I can now say I've downloaded a skin I will be using for a while to come. Thank you for all of your hard work and effort! This is again an amazing skin. To a fellow avast! user, make one of these for avast! May the virus protection be with you. And you should get the new update. Great skin! What's the IP? vorkeyone - you are using an old version of WB. Update it!